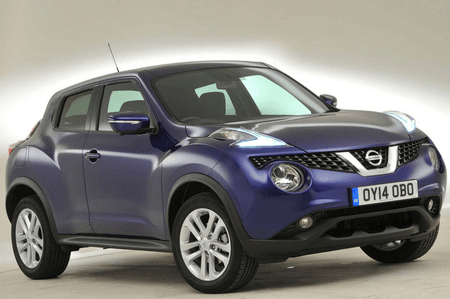 Nissan Juke Boot Space, Size, Seats | What Car? Every model in the Nissan Juke range comes with driver’s seat height adjustment as standard. However, the low roofline and high driving position mean it feels a little more snug inside than, say, the Kia Soul. There is just about enough elbow room to avoiding brushing your passenger by accident – but only just. The glovebox is a reasonable size, and there are two large cupholders in the centre console. The door pockets are not particularly long, but are shaped to take water bottles. There’s a small shelf with a grippy rubber base in front of the gearstick, which is perfect for your mobile. Taking all these features into account, it’s unlikely you’ll struggle to find space to stow your accessories. 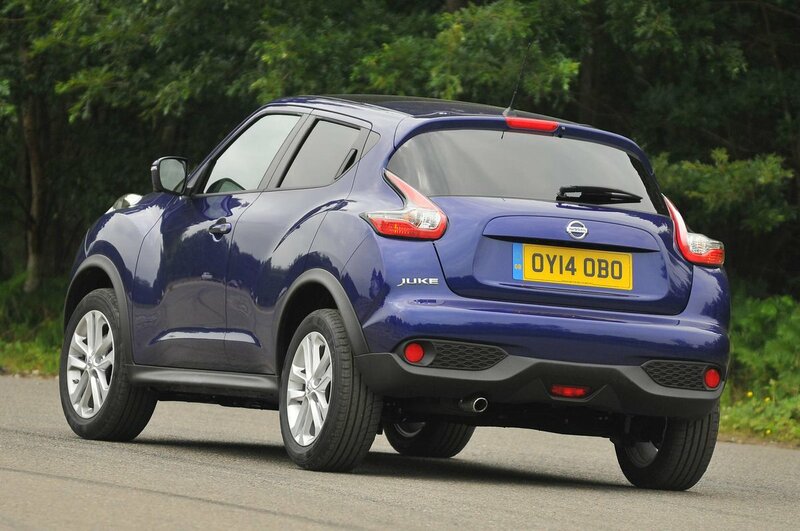 If you're taller than average, you'll be more comfortable in the front of the Juke than in the back. Its roof is steeply sloped, so head room is really tight, and the narrow, tinted rear windows and dark roof lining make occupants feel even more hemmed in. The interior is too narrow to sit three across the rear bench in any sort of comfort, and the doors don’t open very wide. They cut into the wheel arches, too, so climbing in is tricky compared to with more conventionally-styled cars. On the plus side, there’s a pair of useful, bottle-shaped door bins, and the central tunnel doesn’t obstruct the foot wells too badly, even in four-wheel-drive variants. 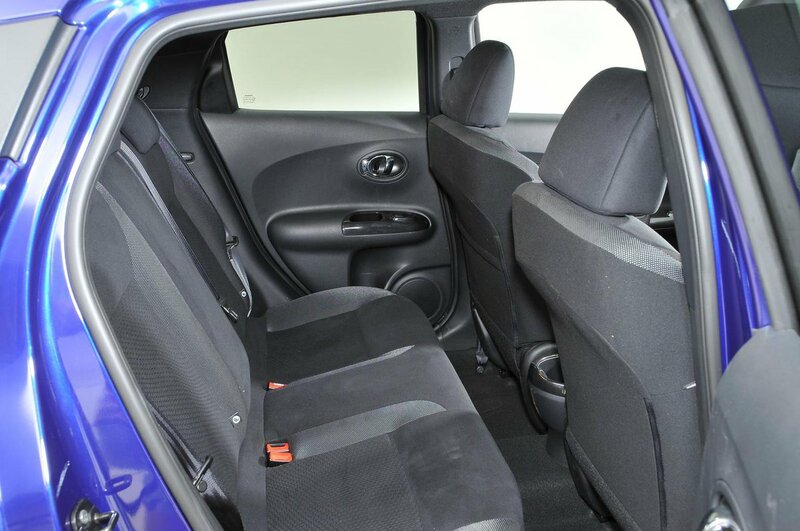 Getting the Juke's split rear seat to fold is fairly easy and best achieved with the back doors open. All you have to do to drop the backrests is push a few plastic buttons. The seats aren’t particularly heavy either, so repositioning them isn’t a struggle. However, unlike the Renault Captur, the rear bench doesn’t slide forwards and backwards to increase storage space or leg room. The front passenger seat is not height adjustable. One of the biggest improvements made to the Juke during its mid-life refresh was an increase to the size of its luggage area. Barring the four-wheel-drive versions, every Juke now comes with an adjustable boot floor. In its lowest setting you can just about fit a set of golf clubs or a buggy behind the rear bench. If you fold the back seats down, the false floor removes the deep lip in the load bay, but the seat backs don’t quite fold flat. The shape of the opening, the rake of the back seats and the intrusive plastic side panels also limits what you can fit in.